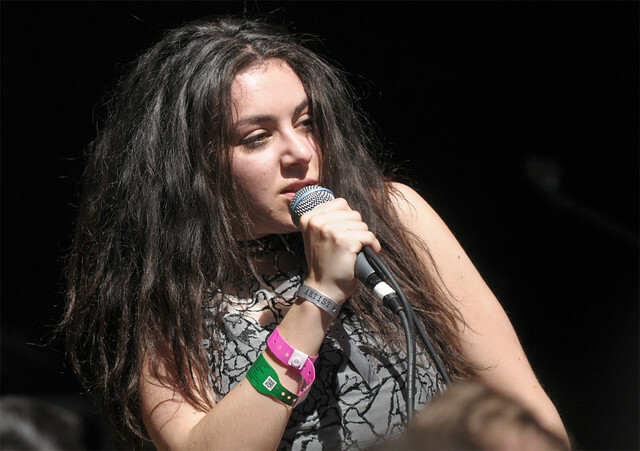 Charli XCX performs at SXSW. Charli XCX (aka: Charlotte Aitchison) is currenty one of the hottest artists around today, sharing the stage with Ellie Goulding and Marina and the Diamonds. She even postponed her U.S. headlining tour when pop-rockers Paramore asked her to open up for them on their UK tour. She's also in high demand as a songwriter. She penned Icona Pop's hit song "I Love It" and she recently revealed that she was asked by Britney Spears' people to write a song for Brit Brit's upcoming album. In fact, Time Magazine recently named Charli XCX one of the "11 Albums to Look Forward to in 2013" describing her voice that "...outshines many more seasoned singers," and her songs that are "...alternately gorgeous, anthemic, throbbing and occasionally weird, with soaring vocals and swelling choruses that sweep you up in their melodies." Today, she released her new video for "SuperLove," a bouncy, pixie-dust of a song set in a Japanese disco complete with dancing robots and sugary-pop lights blinking to the infectious beat. Apparently, it's the first single off of her sophomore album which she's currently recording. That album isn't expected to be released until next year. Check out her rescheduled tour dates below. 10-29 Portland, OR - Star Theatre ! 10-30 Seattle, WA - Neumos ! 11-01 San Francisco, CA - Slim's ! 11-04 Los Angeles, CA - El Rey Theatre ! 11-12 Boston, MA - The Sinclair ! 11-13 New York, NY - Irving Plaza ! 11-16 Washington, DC - U Street Music Hall !